Thanks to the rotation of the earth, stars look like streaks in long exposures of the night sky. To avoid that exposures need to be kept short. The “500 rule” is a commonly accepted guidelines for photos of the night sky with minimal star streaking. Divide 500 by the focal length of the lens you are using and that is your maximum exposure time in seconds. If you are using a 50 mm lens, your shutter speed should be no longer than 10 seconds (500 divided by 50). With a 25mm lens your shutter speed should be no longer than 20 seconds. 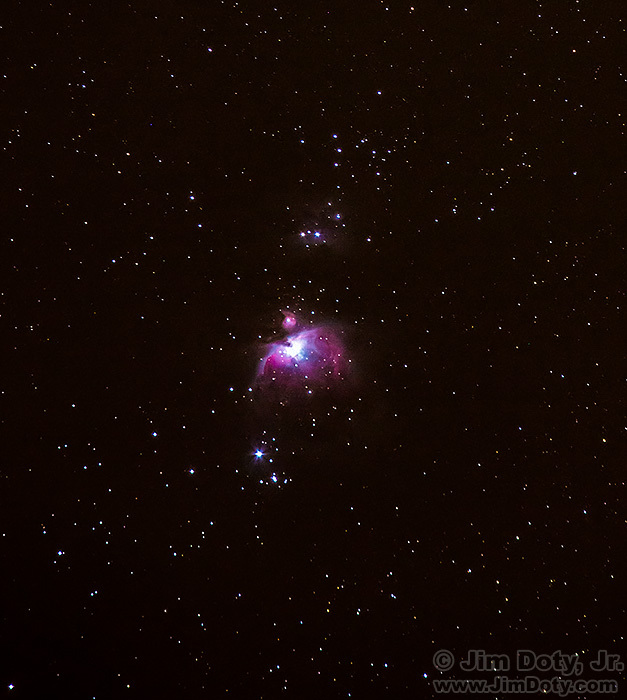 I wanted to use a 300mm lens to capture the Orion Nebula. 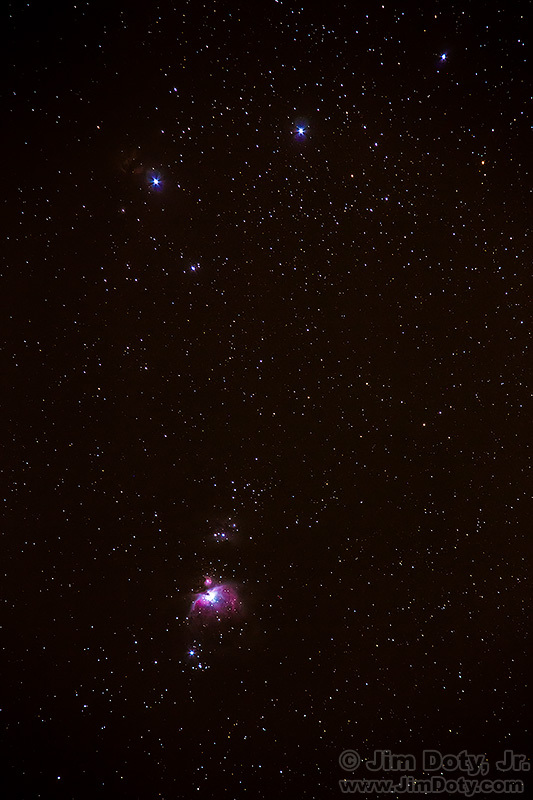 That gives me an exposure limit of less than 2 seconds, no where near long enough to capture the Orion Nebula. 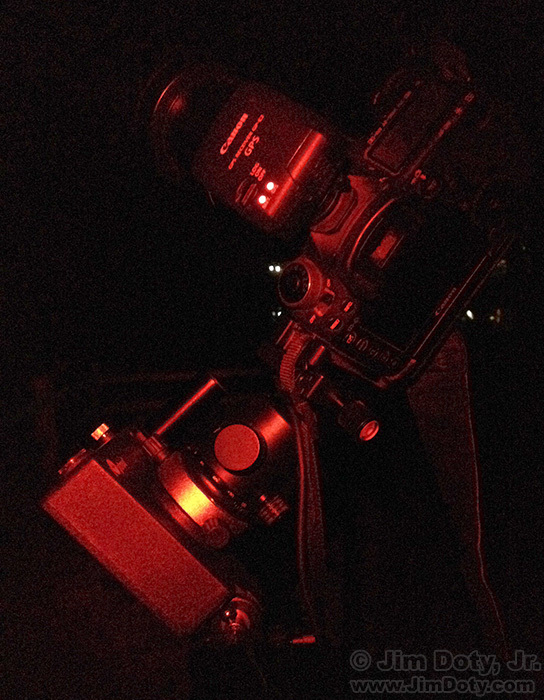 iOptron Sky Tracker and ball head with camera and lens. That’s where the sky tracker comes in. Properly aligned with the North Celestial Pole, a sky tracker follows the motion of the stars across the night sky. My exposure time for the photo above was 177 seconds, with a lens aperture of f/11 and an ISO of 800. The Orion Nebula is bright and clear. This is my favorite image for March 10. Here’s a closer look, cropped from the center of the photo. The sky tracker makes this kind of image quality possible. Without the sky tracker, I would have to change the lens to the maximum aperture of f5/6 and crank the ISO up to 25,600 to get a shutter speed of 1 1/2 second (to get within the 500 Rule), and I would end up with nothing like the quality in the photo above. You can learn more about the iOptron SkyTracker here. Orion, Canis Major, Sirius, Taurus, Hyades, Pleiades. 17mm focal length lens and camera mounted on an iOptron Sky Tracker. For the sake of focal length comparison, this is a photo taken at the same location with a 17mm wide angle lens. 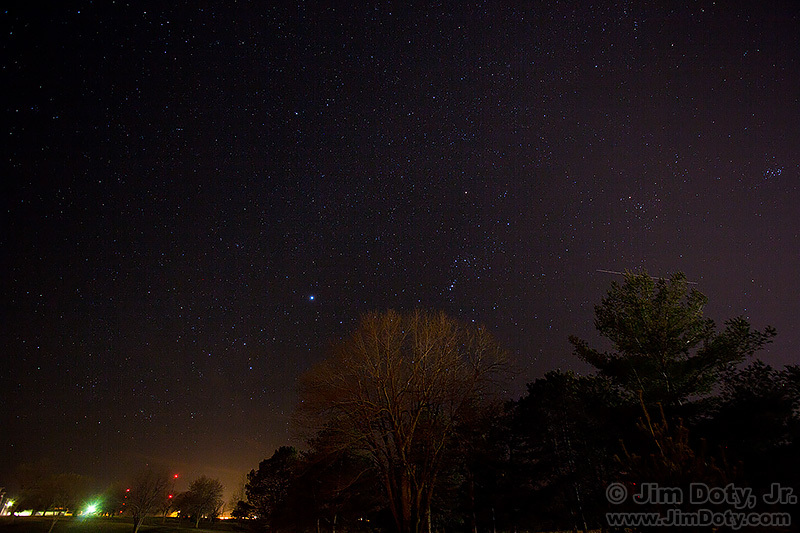 Orion is above the tree at the bottom center of the photo. If you are not familiar with Orion, the three horizontal stars in the middle are Orion’s belt and the three stars below that are Orion’s sword. The Orion Nebula is the center star of the sword.